(November 27) Some of us had heard that there might be a civil disobedience action at some point on Sunday (November 25). So after the very powerful and emotional litany of names of those who had died in the desert or had been tortured or killed by U. 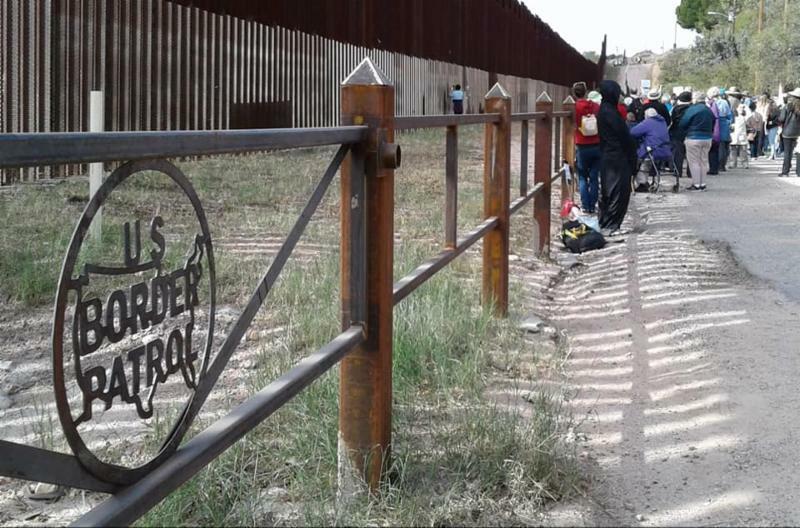 S, trained troops, folks began to cross a newly installed fence by the Border Patrol. Very solemnly, prayerfully, those risking arrest began planting marigolds. They each had a little trowel to dig into the rocky soil. They brought bottles of water for the plants. Then they laid down, holding a cross, each with the name of a person who had died. And they laid still, as if they had died. After about five minutes, I wanted to join them, so I climbed the short fence and knelt to pray. Although I've been volunteering with Samaritans since 2005, putting water out in the Arizona desert, only once have I encountered human remains, about five years ago. But it was shockingly dramatic. There were four of us tired after a long day of putting out gallon jugs of water. I saw the remains first, pointed out to everyone what we had just found and all four of us went right to our knees to pray. 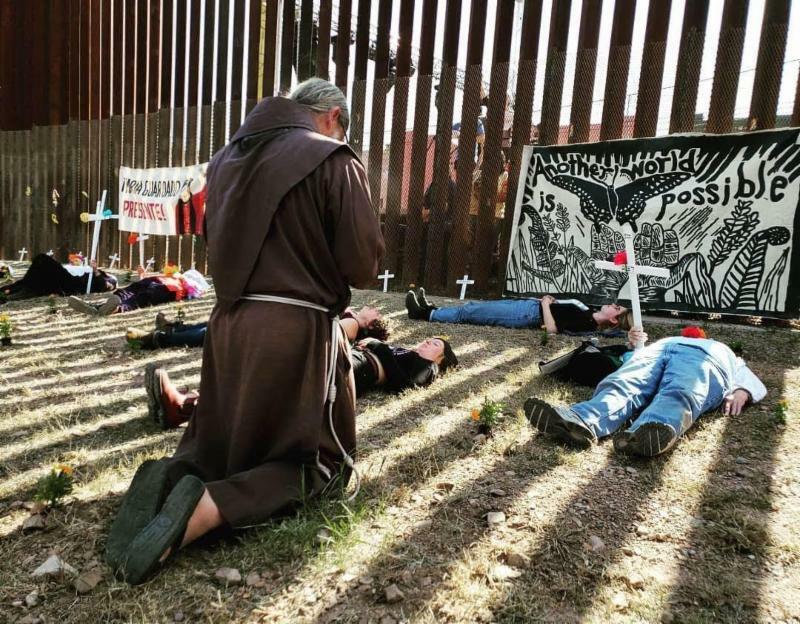 That scene came to my mind, kneeling there by the actual border fence. I decided I would stay there until the authorities told us we had to leave. There was a slight risk of arrest. 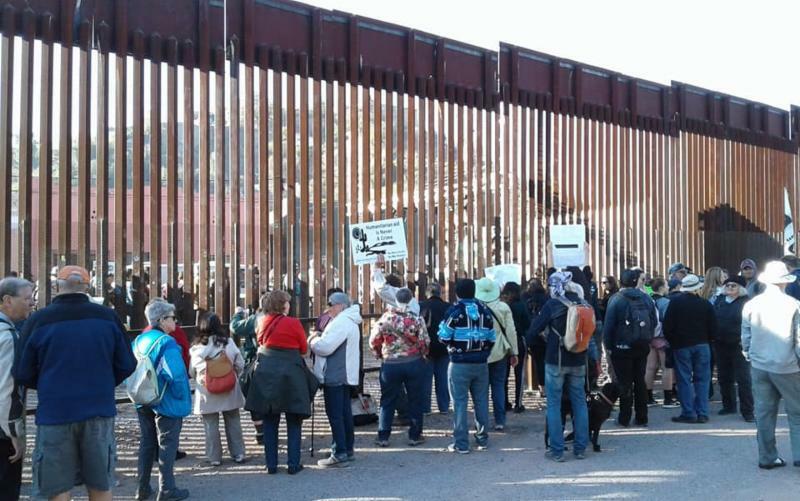 But as it turned out, the Border Patrol and other authorities left us alone for 20 minutes until our action was concluded. As we got up I was happily surprised to see that the woman to my right, was an old friend of 35 years from the St. Louis Catholic Worker, Loretto Sister Mary Ann McGivern, SL. (November 16) At the School of the Americas weekend in Nogales. Our group assembles on both sides of the fence. The two pictures below are taken on the Arizona side.... 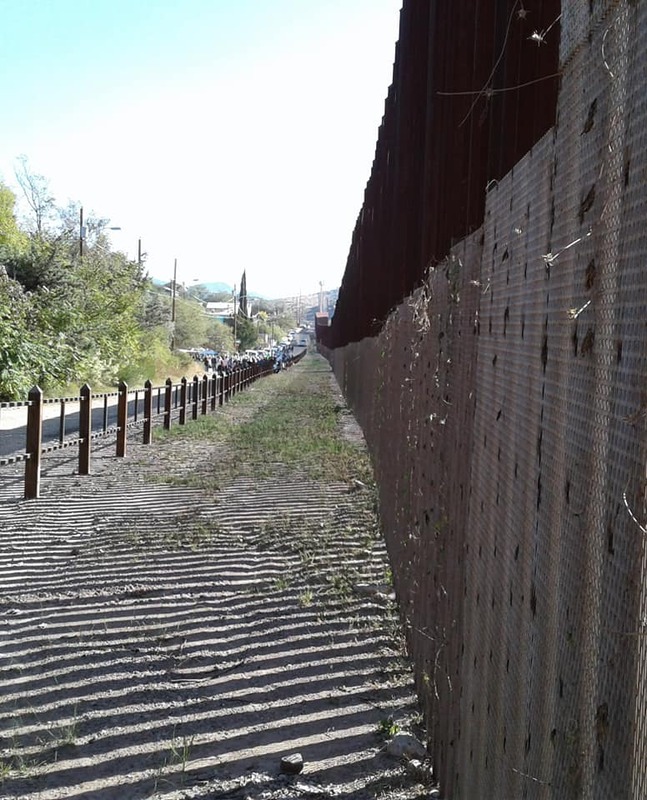 Your tax dollars have paid for a new fenced in area, so we cannot get right up to the wall. This is new this year. Border Patrol "guarding" us. There is a stage on the Sonora side of the fence. Speakers and music all morning. This afternoon are workshops, presented on both sides. franciscansforjustice@gmail.com. 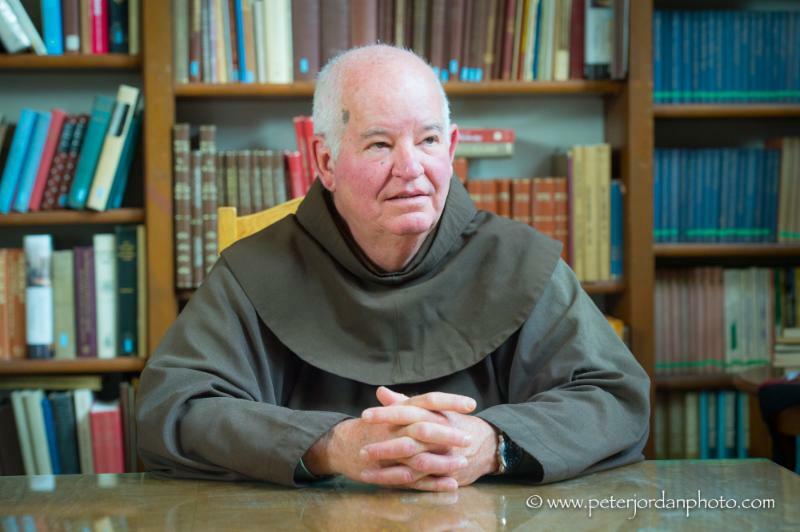 Mark heads the Franciscan for Justice office, a joint project of the O.F.M. Franciscan Friars of the St. Barbara Province and the Our Lady of Guadalupe Province. We have been in touch with Catholic religious men and women in Mexico City. They and other interfaith partners have issued a call for support, both in the form of direct, physical, and pastoral accompaniment and in the form of financial resources. Such support is needed to offer solidarity with our migrant sisters and brothers fleeing different forms of violence in Central America. 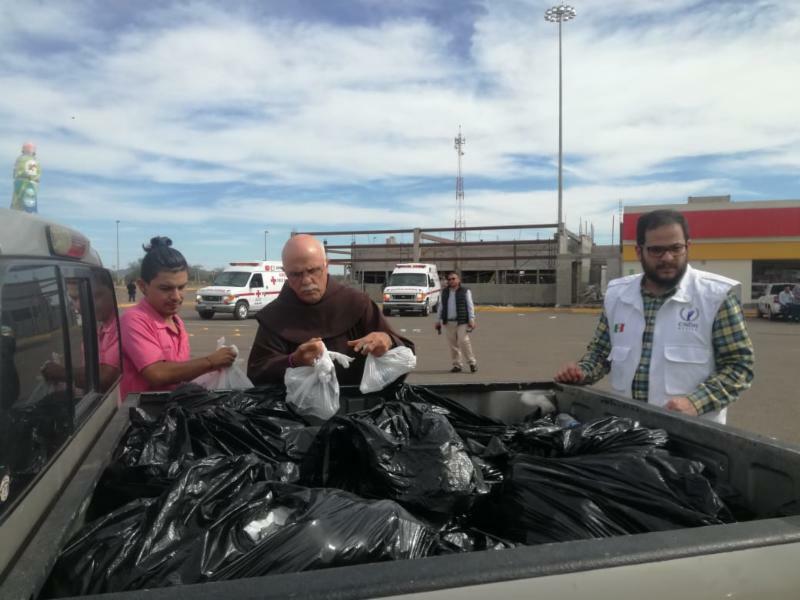 The accompaniment is needed both in Mexico as migrants are walking north to the U.S. border and at the U.S. border when they arrive . . . . There are also additional migrant communities just beginning their journey from central America toward Mexico. 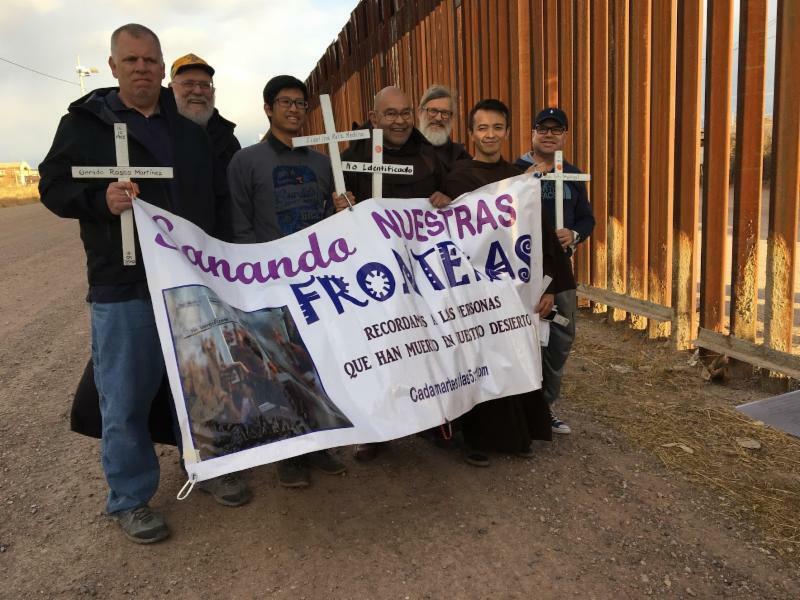 Top right - Friar David Buer from the School of the Americas (SOA) Watch Border Encuentro event in Nogales, AZ November 16-18. Photo courtesy of Sister Judy Bourg, SSND. Two days ago, our local media contacts said that thousands of Central Americans heading north in "caravans" would be passing through Guaymas heading to Tijuana at the end of November or early December. 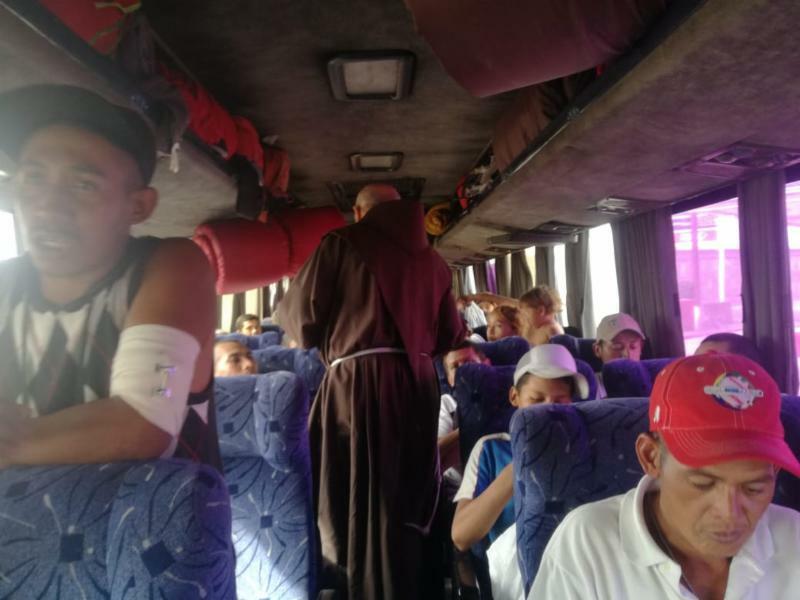 Much to our surprise, yesterday two groups of 10 to 12 buses stopped for about an hour at a truck stop near Guaymas to give the folks the chance to use the bathroom an stretch their legs a little. One group came by around 11:00 AM and another around 11:00 PM. 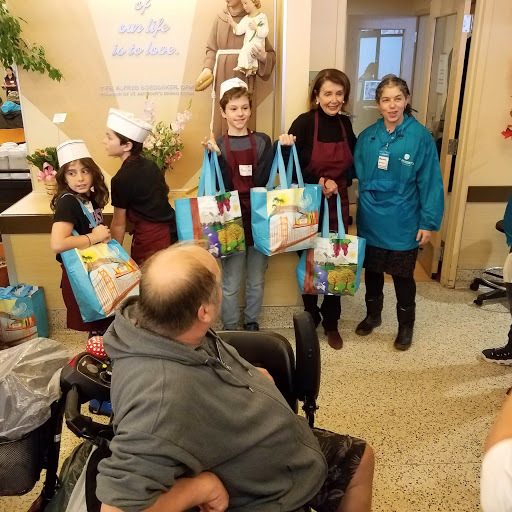 Employees from Casa Franciscana and other volunteers rose to the occasion to give out about 800 care packages (tuna, crackers and bottled water) along with diapers and sanitary napkins as needed. In other words, 1600 care packages in one day. 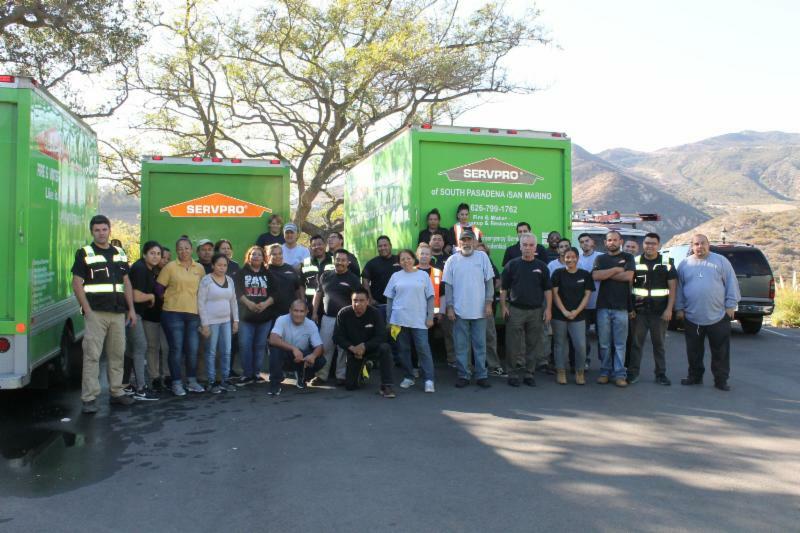 Three cheers for the great employees of Casa Franciscana Guaymas!! According to our sources, thousands more migrants heading north will pass by Guaymas soon. Not all the buses will stop by us, but we will try to offer a little food and water to those who do stop by us. Please keep the great employees of Casa Franciscana Guaymas, Raúl and me in your prayers. Photos: All photos courtesy, Tommy King OFM. 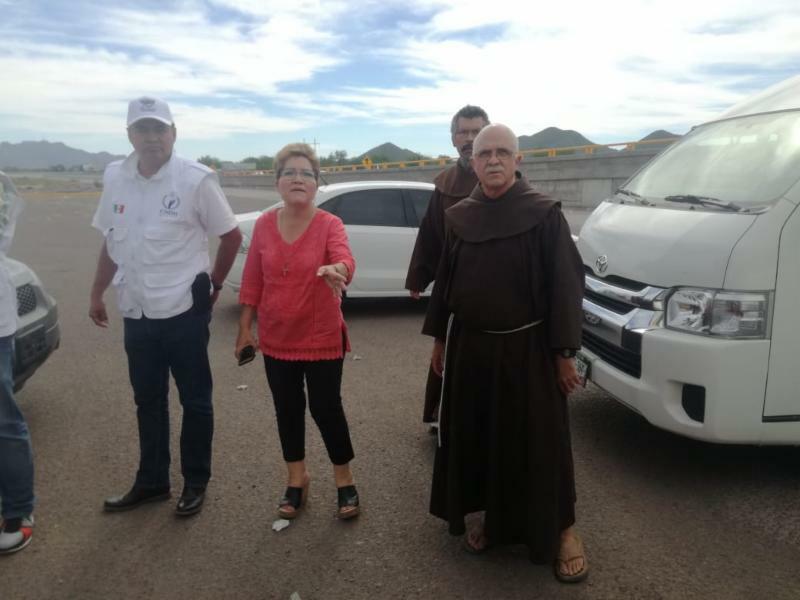 Top Right - Adriana Murrieta (Director of Administration at Casa Franciscana), a representative of the Mexican government Office of Human Rights, Friars Raúl Diaz and Tommy King looking on as the buses of Central Americans arrive at the truck stop by Guaymas. Jorge Johnson (Chef of the Culinary School at Casa Franciscana) and Friar Tommy King loading up food bags for the migrants. to a bus full of Hondurans. 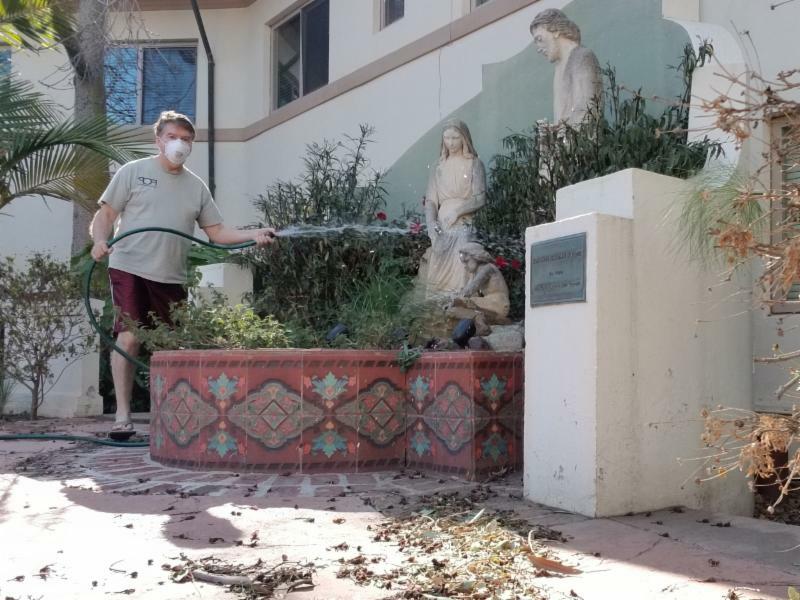 Sister Maureen Duignan OSF (a Franciscan Sister of Philadelphia) and her work at the East Bay Sanctuary Covenant, are the focus of a recent feature article (October 18), by Jamie Manson of the National Catholic Reporter as part of their online project, the Global Sisters Report. 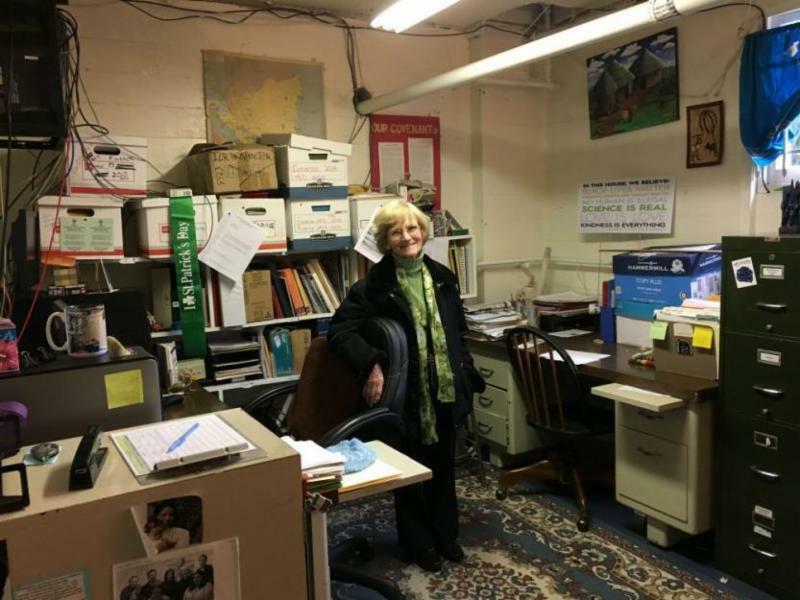 As Executive Director since 1982, Sister Maureen has overseen the ecumenical effort to assist undocumented immigrants as well as refugees seeking asylum status in the United States. Since those early days, literally thousands of applicants have streamed through the doors of the basement offices of ESBC. Many friars are quite familiar with Sister Maureen and her extraordinary team, having themselves served as volunteer interns over the past three decades. 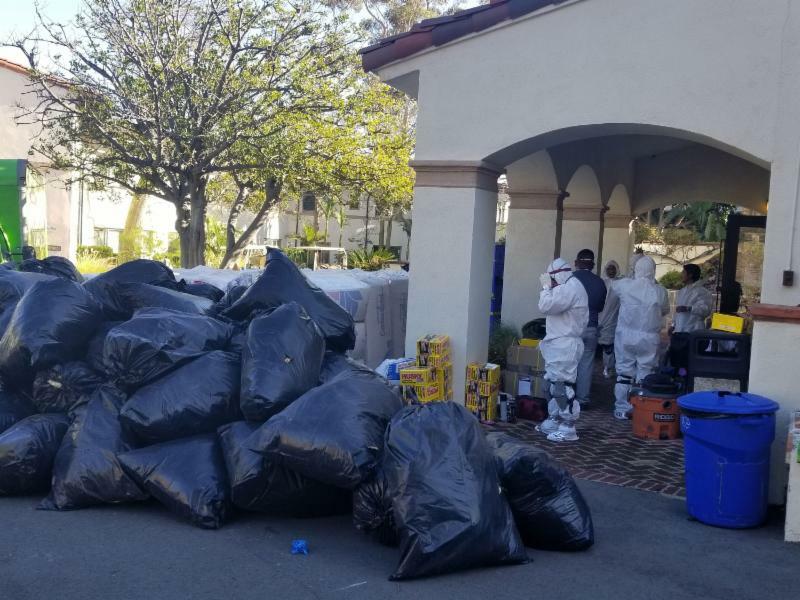 At present, the group, which relies upon an extensive network of volunteer legal assistance, has some 5,000 active clients, including more than 1,000 people who are waiting for an interview with an asylum officer. 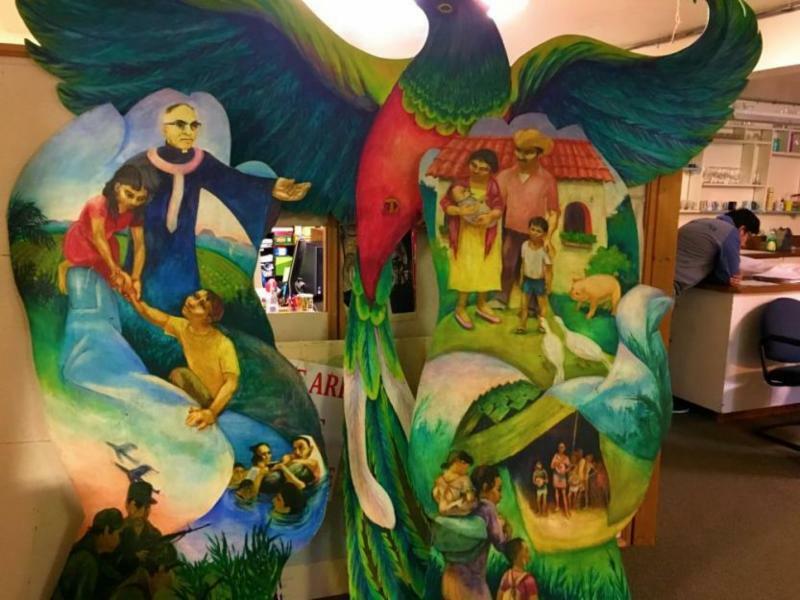 The majority of clients come from Central America, but the organization has served asylum seekers from more than 50 countries around the world. Excerpt with permission of National Catholic Reporter: Global Sisters Project. Here are two group photos. 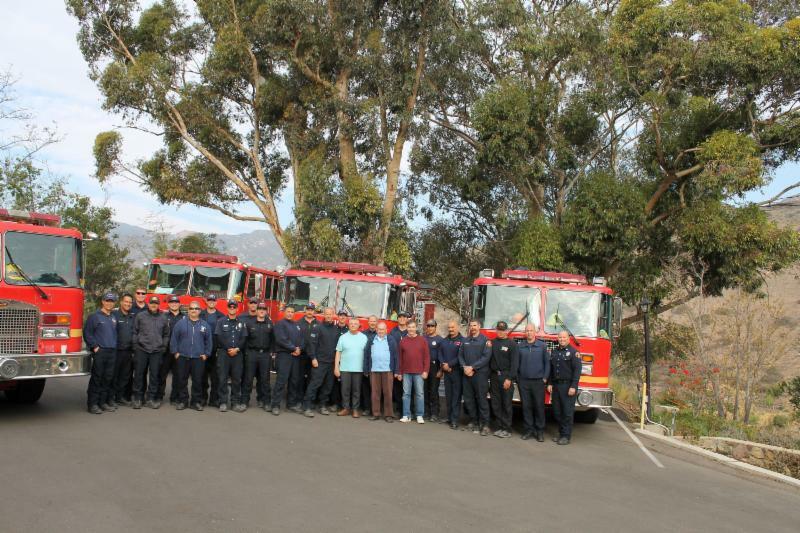 The first one of the firefighters who stayed at Serra Retreat during the fires. 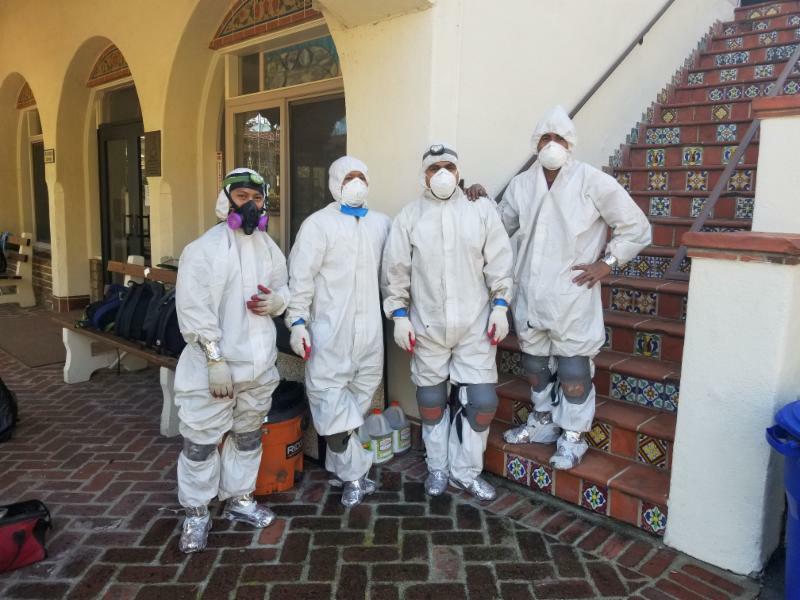 The second group picture is some of the ServPro folks who were here to help clean the rooms from the smoke smell and soot and ash that covered the retreat center. Great workers. -- Giuseppe Tomasi di Lampedusa. I am grateful to all of you in so many ways, but perhaps mostly I am grateful for your Franciscan hearts. The fact that you are trustees, board members or work at the Foundation is evidence to me of your commitment to the common good and your concern for all people, especially those that are on the margins of society. 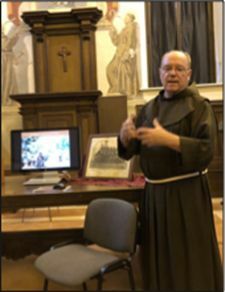 I see all of you as “Franciscans”, in my mind you are part of a long tradition that goes back over 800 years. 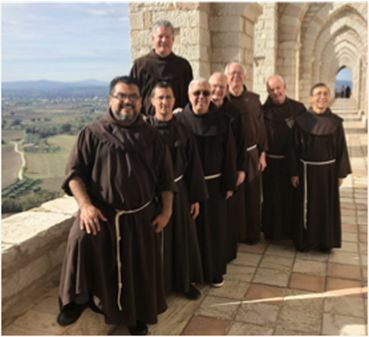 The men in brown robes are just one of the many keepers of the Franciscan flame. As I travel around the Western part of the United States, the territory that makes up the province of St. Barbara, I am constantly aware of the reality of change. Change today is the only constant in all of our lives, whether in technology, political interaction or the divisiveness we see in the world today. I see change everywhere throughout the province in all our sponsored ministries. Since, I know the historical founding of these ministries, and their development over the years, I try to understand each place’s special issues and concerns. Some of these changes perhaps we feel are for the better and other changes not so good. Recently, we were very lucky to attend the ESC Vocations Friars meeting in Dublin. 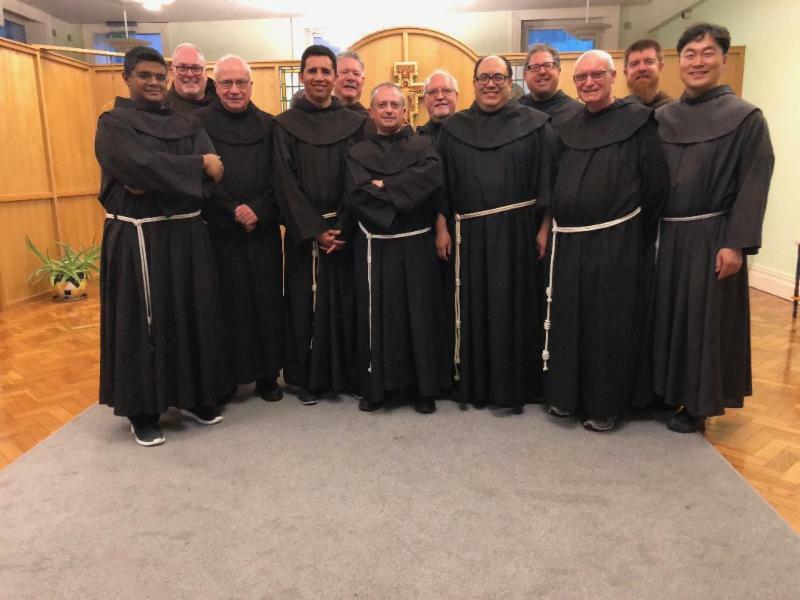 Friars from Canada (from newly merged Holy Spirit Province), Ireland, Malta, England and the US were hosted by the Irish Province at the Adam and Eve friary for the meeting. The group discussed both ESC matters and the US provinces’ voting to merge. There were also discussions about working together for the mutual promotion of vocations; addressing the recent Church scandals; and, connecting with the millenials and Generation Z discerners, etc. It was productive and fraternal, with special speakers Friar Francis Cotter of the Irish Province and Margaret Cartwright, Director of Vocations for Vocations Ireland. Friars Pat Lynch (the Irish vocations director), Friars Niall O’Connell the guardian, and Aiden McGrath the Provincial Minister-- and even Adrian Peelo-- warmly welcomed us. Also, we were fortunate that Sacred Heart Province Provincial Minister Tom Nairn was there representing the ESC provincial ministers. We’ve heard it said and we say it ourselves: Siempre adelante! Keep going! But we’ve also heard it said, quite bluntly: Don’t get your hopes up! Which message should we listen to? 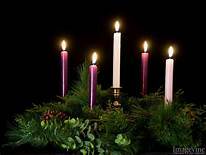 Advent, this ultimate season of hope, challenges us to consider some fundamental questions: What gives us hope? What keeps us going in difficult times? How can our faith traditions help us to re-center ourselves as a Christian people, a people of hope? First a word from an unexpected center of hope. The country of Sweden, tucked away in the northern reaches of Europe, is one of the most affluent and secularized societies in the world. It has only a very small group of observant Christians, including a surprisingly vibrant Catholic community. From Cardinal Anders Arborelius of Stockholm, we hear these words of tremendous hope: ". . . the dark collective night (of the soul) can even penetrate the Christian heart. We see it in the lack of vocations and in the empty churches in Europe. Nevertheless, we need hope to continue our pilgrimage in this world. Hope helps us see our journey from the perspective of eternity.” Referring to the French author Charles Péguy he continues: "We talk a lot about faith and love, but often forget hope which is, nevertheless, an enormous force—even and especially in our secular society. Hope is the little sister to faith and love. We really need this ‘little sister’ for our continued pilgrimage Because it is hope that determines the direction of the journey in our lives and helps us to survive in the hardest moments of our existence. Hope is always necessary. We must not lose hope that the Lord will help us on our path." 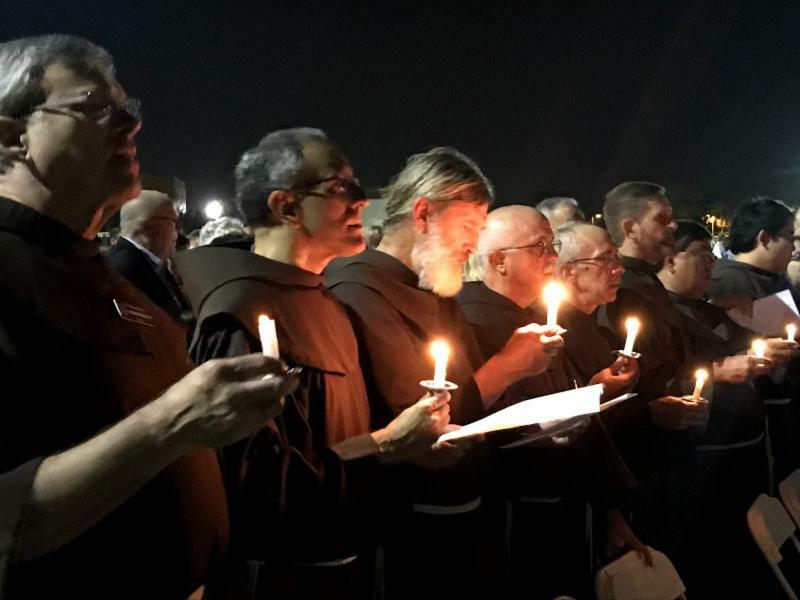 Arizona friars at memorial service for victims of Pittsburgh killings. Photo: c. Peter Jordan. 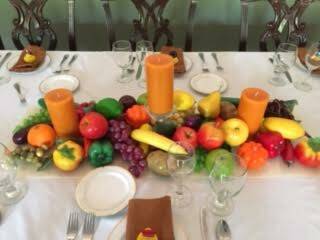 In the runup to the Thanksgiving holiday, US Congresswoman Nancy Pelosi (D-CA), volunteered along with several of her grandchildren, to serve in the St. Anthony Dining Room, San Francisco. 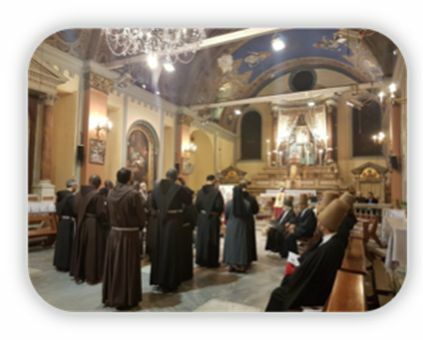 On October 27, friars joined in prayer with Sufi (Whirling) dervishes from the Islamic community of Istanbul to celebrate the “Spirit of Assisi” initiated by Pope John Paul II on October 27, 1986. This dance/prayer ceremony of the dervishes, called a sama, dates roughly from the time of St. Francis. The first part of our evening together was guided by the friars, using prayers and songs in several languages. After that, our Muslim brothers extended the prayer time as they performed their own ritual. At the conclusion of the evening, we filed into two lines and processed in silence out of the church, each friar shoulder-to-shoulder with a member of the dervish group. Excerpt from ATP (Around the Province) newsletter of Sacred Heart Province. Pepe Martinez OFM, Editor. 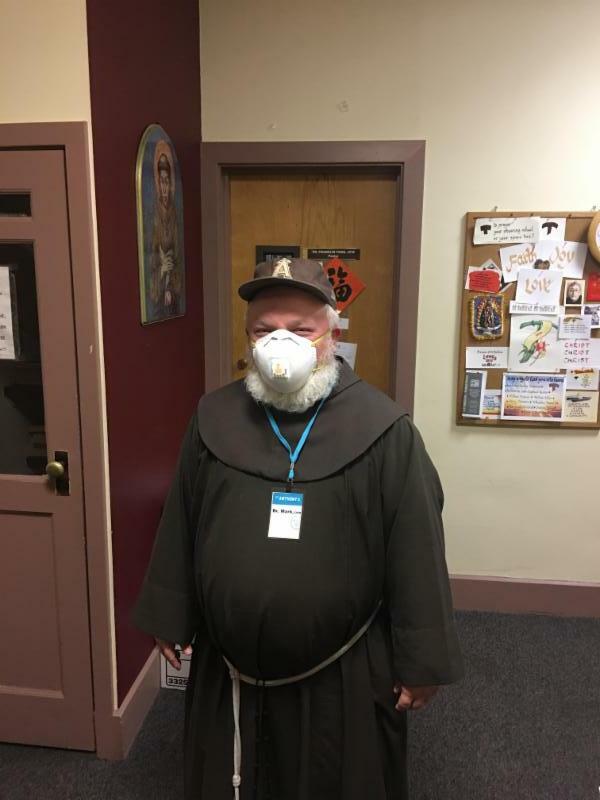 Friar Mark McPherson demonstrates one of the popular N95 Military Grade Anti Air Dust and Smoke Pollution Mask with Adjustable Straps and a Washable Respirator that has been one of the hottest fashion items in California this past month. Thankfully, the fires are now 100% controlled.